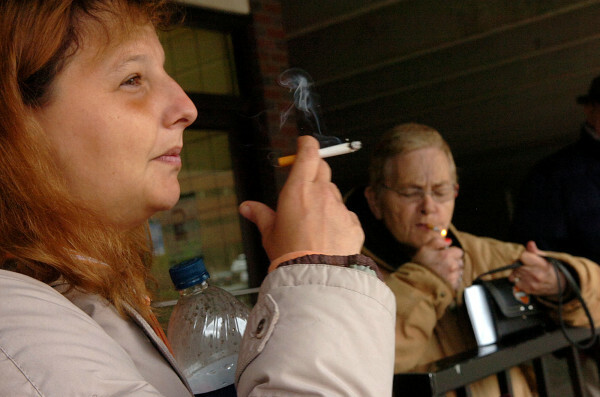 Crystal Fogleman (left) and Alice Goan (right) both of Bangor, smoke cigarettes as they wait for a bus in downtown Bangor in this 2011 BDN file photo. NEW YORK — U.S. health regulators on Thursday approved Medicare coverage for lung cancer screening by low-dose CT, the first time the government health insurance program for the elderly and disabled will pay for such a program of early detection in an effort to save lives. The decision applies to Medicare beneficiaries ages 55-77 who are current smokers or who quit within the last 15 years, and who racked up at least 30 “pack years.” The latter is possible if they smoked one pack a day for 30 years, for instance, two packs a day for 15 or three packs a day for a decade. The usually incurable disease will kill about 158,000 people in the U.S. this year, according to the American Cancer Society, and 221,200 cases will be diagnosed.